In the spring of 1889 the University of Pennsylvania Medical Class of 1889 commissioned Thomas Eakins to paint a portrait of D. Hayes Agnew, who was retiring as professor that year. Eakins made the decision not to do a conventional portrait of Dr. Agnew, but instead to create a work along the lines of “The Gross Clinic,” painted by Eakins fourteen years for the alumni of Jefferson Medical College. 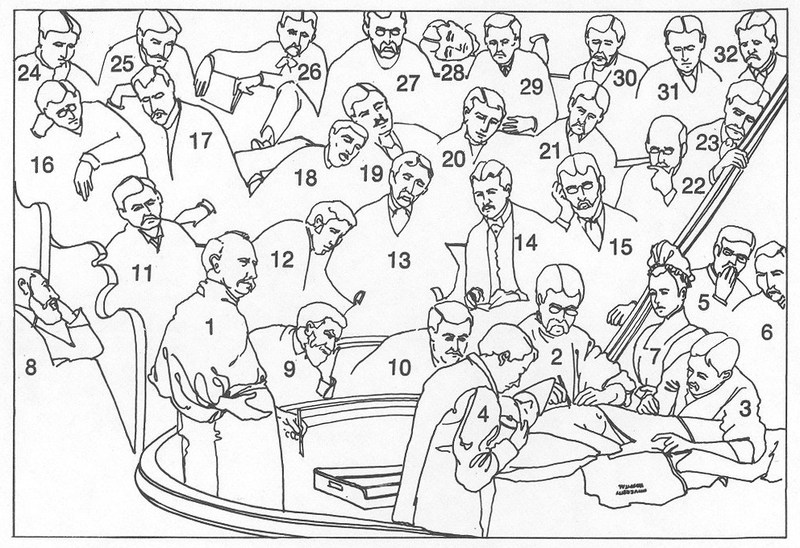 Both “The Agnew Clinic” and “The Gross Clinic” present portraits of an esteemed doctor and professor as he performs surgery for medical students in a amphitheater. In 1875 Eakins depicted Dr. Samuel Gross performing surgery for students at Thomas Jefferson Medical College, while in 1889 the artist portrayed Dr. Agnew performing a mastectomy for students in the University of Pennsylvania’s Medical Department. During the intervening period between these two paintings, however, Joseph Lister’s discoveries had led to the promotion of antiseptic surgery by Agnew and others, which contributed to clear artistic differences between the two paintings. Whereas Dr. Gross had performed surgery in his street clothes with minor help from his assistants, by 1889 Eakins depicted Agnew and his team of doctors as wearing clean white gowns, using sterilized instruments in a covered case, and benefiting from the services of a nurse. The emphasis on hygiene led to the lighter colors used in the Agnew Clinic painting, and the greater involvement of assisting medical staff influenced the switch from the vertical format of the Gross Clinic painting to a horizontal format for the Agnew Clinic canvas. 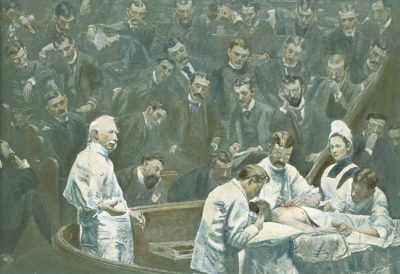 In Eakins’ depiction of the Agnew Clinic, Dr. Agnew is being assisted by Penn professors Dr. J. William White and Dr. Joseph Leidy (the nephew of famed professor Joseph Leidy) and by Hospital of the University of Pennsylvania physician Dr. Ellwood R. Kirby. On the far right, another HUP physician, Frederick H. Milliken, is in conversation with Eakins himself, painted by his wife, Susan Hannah Macdowell Eakins. The nurse is Mary U. Clymer, a student in the HUP Training School from 1887 to 1889. 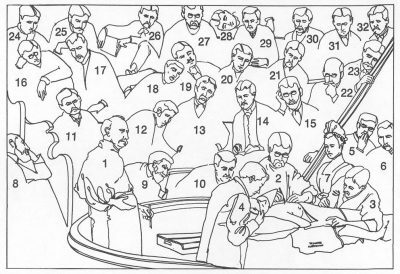 The medical students portrayed in the amphitheater of the Agnew Clinic include 18 members of the Medical Class of 1889, 4 members of the Class of 1890, 2 members of the Class of 1891, and one doctor enrolled in the fourth-year, postgraduate course. Eakins completed the painting of the Agnew Clinic in time for the Commencement of the Medical Class of 1889, held at Philadelphia’s Academy of Music on May 1, 1889. After a valedictory address given by William Osler, the 7 by 11 foot painting was presented to the University by the three classes of the Medical Department, with Joseph Allison Scott, M.D. 1889, offering a few words at the moment of unveiling. After Dr. S. Weir Mitchell accepted the art work on behalf of the University trustees, a loud and enthusiastic call was heard from all quarters for Dr. Agnew himself. Dr. Agnew responded with a few words, so warmly applauded by the students that he became quite emotional before recovering to wish them all success in their profession. Considering the realism of this artwork, the emphasis on dissection in the medical education of the Class of 1889, and the friendship of Thomas Eakins and Eadweard Muybridge, it is not surprising that it has been said that members of the Medical Class of 1889 served as models for some of Muybridge’s Animal Locomotion photographic prints. This is quite possible since Muybridge was still at work on the Penn campus taking photographs for this book when the Medical Class of 1889 began their studies. Unfortunately, most of the models remain unidentified. “The Agnew Clinic” by Thomas Eakins remains the property of the University of Pennsylvania, but the public can view the painting at the Philadelphia Museum of Art where it is currently housed under a renewable loan arrangement. Students and Medical Staff Included in "The Agnew Clinic"